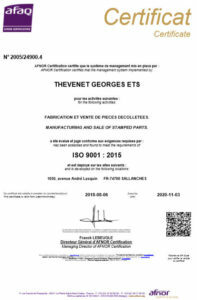 Our quality insurance system guarantees our performance and our ISO 9001 version 2008 certificate confirms this implication in the bar turning industry. Continual controls are integrated in our manufacturing process and assure our production reliability. Our computerized system assures our entire production’s traceability. We are equipped with a 100% sorting machine with a camera surveyed rail that controls all cylindrical turned parts, diameters and lengths, as well as a sorting machine equipped with trays and 4 cameras that control lengths, diameters, presence of internal threads, chips and other characteristics.